Image credit: © San Diego Zoo Global. All rights reserved. Walk on river bottoms and on land; do not really swim. Charge with surprising speed. Nocturnal. Common hippo pends day submerged in water. Pygmy hipps rests near water, but also on dry ground. Gregarious. Typical herd size of common hippo is 10-15 individuals, but ranges from 2-50. Pygmy hippo is less gregarious, being solitary or found in pairs. Grasses and other browse vegetation near rivers. Humans. Nile crocodiles, hyenas, and lions, when young. If enough resources, able to give birth every year. 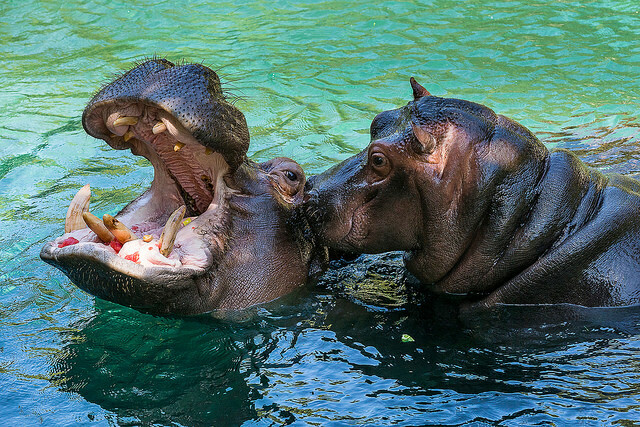 Hippopotamus essentially translates to the Greek for "river horse"
Ancient Egyptians exhibited hippos in a private zoo 3500 years ago. © 2011-2019 San Diego Zoo Global. Population updated Feb 2019. Disclaimer: Although San Diego Zoo Global makes every attempt to provide accurate information, some of the facts provided may become outdated or replaced by new research findings. Questions and comments may be addressed to library@sandiegozoo.org. SDZG Library Mission: to provide outstanding information resources and services to advance knowledge in animal and plant care and conservation, inspire passion for nature, ignite personal responsibility, and strengthen our organization’s capacity to save species worldwide.